We realise that choosing a chandelier or fixture for your home is rarely an easy task; there are so many different variations and options to choose from – things that you may never have even considered before you began your search for the perfect fixture to complete a room. The purpose of this article is to help identify some of the variations you can get when looking at purchasing a fixture, what they mean and what they will mean for you. And if this article isn’t enough and doesn’t make it crystal clear for you, we are always more than happy to listen and answer any other questions you may have – either via the phone or email! Please don’t hesitate to get in touch. Before ANYTHING else, you need to know the size of your room/landing/stairwell/wherever you are planning on having a fixture hung. This is so essential in ensuring the chandelier is the right size for the room, too small and it will be swallowed up, too big and it will take over the room! For more information, please click here to see a previous article all about instructions on how to find out and more! Once you know the size of the fixture you will need, the fun then starts! A lot of fixtures are available in different finishes. The finish is the colour and shine that the fixture can have. 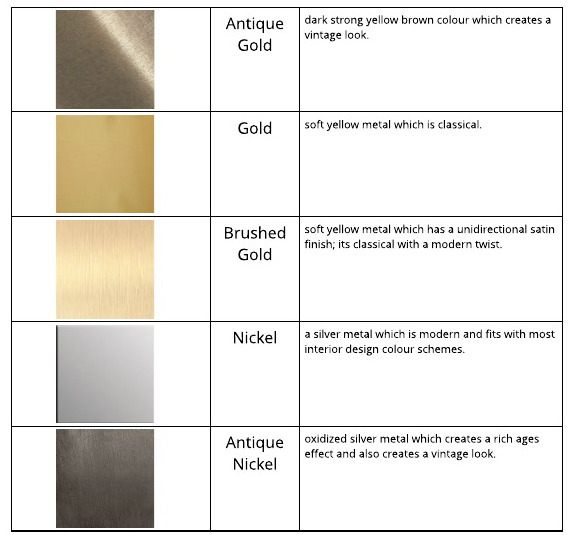 Depending on its availability, our chandeliers are available in antique gold, antique nickel, brushed gold, gold and nickel. As well as being able to change the finish of the chandelier, you can also change the finish of the candle tubes to either match or contrast the chandelier finish, however these are only available in antique gold, glass, gold finish or nickel. Crystal types can be confusing too; many chandeliers come with the added option of choosing which crystals you would like on your chandelier. This doesn’t mean the shape or size of them will change (although even that can sometimes be altered) but it means that the clarity and quality of the crystal can be. 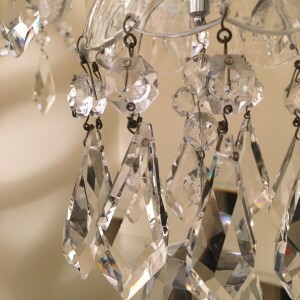 All the chandeliers that Classical Chandeliers sell have a high quality crystal – ranging from 24% Pbo to Swarovski elements, but there are different attributes which make the quality of them differ. In order to establish what these are, we need to go back to distinguishing what crystals actually are. Crystals are formed when lead is added to glass. The lead in the crystals is what refracts the light to create rainbows. With this in mind, 24% Pbo and 30% Pbo are the percentage of how much lead is in the crystal; the higher the percentage of lead in the crystal, the higher the refraction properties the crystal has. 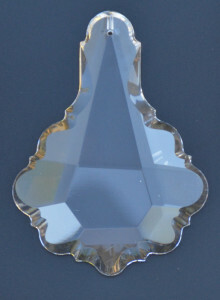 Swarovski crystals are the other type of crystals that are frequently seen in fixtures. These are the highest quality you can get due to the production and processes that are involved in making them; they are made in Austria and are machine cut. Swarovski spectra is lowest on Swarovski’s scale of crystals but is by no means of bad quality! Swarovski spectra in non-leaded which means it isn’t as brilliant but still looks just as pure. The highest quality is called Swarovski elements or Swarovski strass. These are precision cut and have the highest percent of lead content available on the market at 32% Pbo. Swarovski strass is no longer available on the market, but the term may still be used so don’t get confused between the difference of Swarovski elements or strass – they are the same! However it important to note that while there may not be much difference in the crystals, except the rainbows and the way the light refracts, there will be a noticeable difference in the price. The main variations to choose are the finish or the crystal type, however you can always change how many arms a fixture has (we offer sizes from 4 arms to 42! ), the different types of glass arms, if the fixture can be dimmable or not, how long the drop length is and so many more! Our chandeliers are basically custom-made, so you can make ultimately design the chandelier you dream of yourself! If you’ve seen a picture you like but aren’t sure what the chandelier is made from of the design of it, feel free to send us a picture and we can work with you to give you a fixture that is identical or better! We look forward to hearing from you and helping you complete your space with a beautiful fixture.